The life cycle of T. cruzi is relatively complex, as there are different forms of the parasite in both the insect vector (Reduviid bugs) and mammals (including humans but also many other species); all appear to be well adapted to their respective environments, maximizing transmission potential and/or host immune evasion and, hence, long-term parasite survival. T. cruzi cycles between two biologically and morphologically distinct stages in mammals. The trypomastigotes circulate in the blood, where they do not divide, but can enter various types of cells in the host. Once inside a host cell, T. cruzi trypomastigotes move to the cytoplasm and transform into a more rounded form without a flagellum – known as amastigotes. Amastigotes are the dividing form of T. cruzi in mammals. Following multiple rounds of division over 4-5 days, all within the cytoplasm of the host cells, amastigotes convert back to trypomastigotes and leave the now dying host cell. 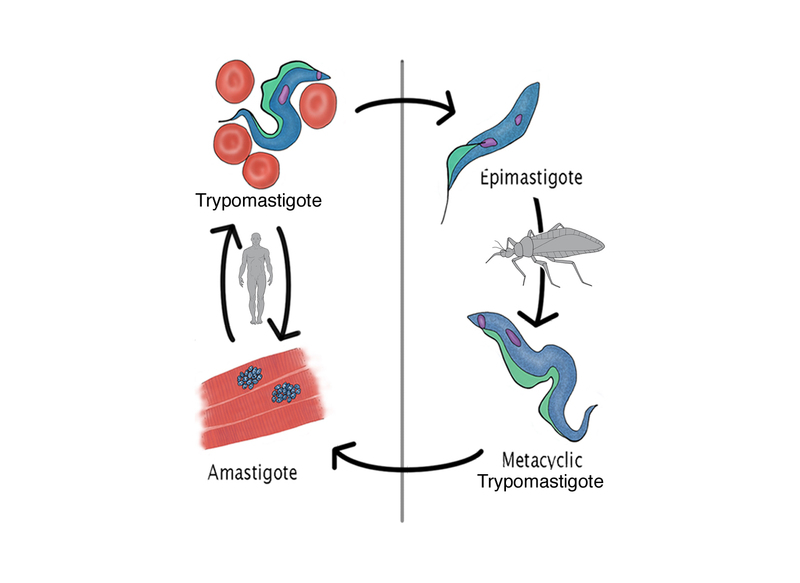 These released trypomastigotes can then infect other host cells locally or enter the blood circulation where they may invade cells in other tissues in the body or be transmitted to the insects during the course of its feeding. In the insect, these trypomastigotes convert to rapidly dividing epimastigotes which remain in the insect gut. 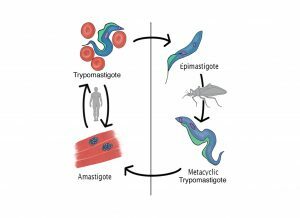 Ultimately, after weeks of replication in the gut, the epimastigotes differentiate into metacyclic trypomastigotes, a stage similar to the blood-form trypomastigotes and capable of initiating infection in mammals. T. cruzi has a rather unique way of infecting mammals. Rather than being transmitted by the bite of its insect vector, metacyclic trypomastigotes are extruded as the infected insect feed – leaving them deposited on the skin of victim. The parasites themselves have no way of invading through the unbroken skin and thus must be mechanically introduced – e.g. through scratching the bite site or rubbing the feces into the mouth or eyes, where the parasites can find hospitable cells to invade. It has been proposed that Charles Darwin had Chagas disease – because of his many ailments and his documentation that he allowed a reduviid bug take a blood meal from him. However it seems very unlikely that this single encounter (even if it was with an insect infected by T. cruzi) resulted in infection of Darwin. This is not an easy infection (for humans) to get – simply traveling in an endemic area or even being bitten by an infected reduviid bug is not likely to result in infection. However eating raw food contaminated by the feces of infected insects is increasingly recognized as a major risk factor for infection. It has also recently been reported that bed bugs can carry T. cruzi and thus are potentially infectious to humans. However transfer of infection from bed bugs to humans (or to other animals, except possibly by the ingestion of bed bugs) has not been reported. Lithium ameliorates tubule-interstitial injury through activation of the mTORC2/protein kinase B pathway. Pomolic acid exhibits anticancer potential against a docetaxelâ€‘resistant PC3 prostate cell line. Neutrophil properties in healthy and Leishmania infantum-naturally infected dogs. Structure-activity relationship study of antitrypanosomal chalcone derivatives using multivariate analysis. Differential proteomic comparison of breast cancer secretome using a quantitative paired analysis workflow. Chagas Patient Registry The registry serves as a link between those at risk of developing Chagas disease, clinicians and researchers.